The Grill | Just Shooting Memories! The only thing I believe I shall miss from summer is the ability to grill out whenever I feel like it. But, that is not what I am talking about when I called this The Grill. This is actually the front of an old fire engine. It was one of the few cars which were covered and actually in pretty good condition for being out in the weather. 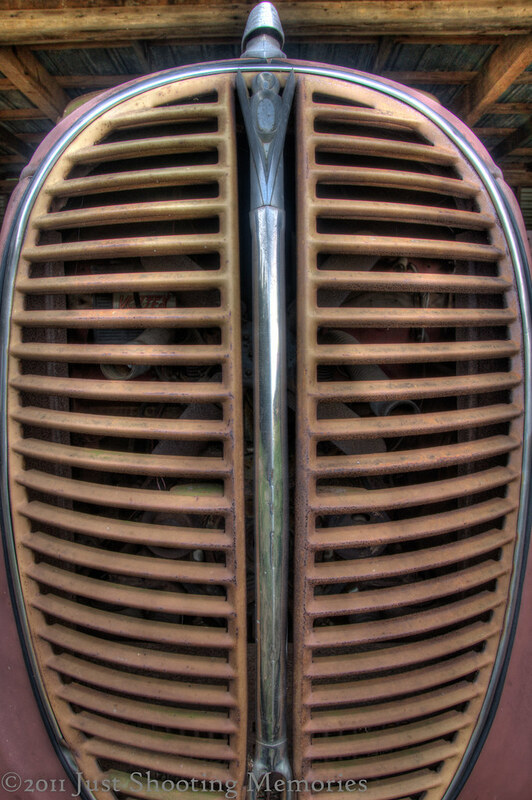 Another shot from Old Car City USA. Hopefully, I will get another shot at it very soon. Maybe this extremely unusual weather pattern, which brought frost this morning, will provide some wonderful snow in early November. One can only wish for perfect conditions. Of course, the idea of perfect weather is a relative thing. Cool shot. I’m enjoying these closeups. Thanks Kris. I get mixed reviews on these. It seems most people want to see the whole car. I guess if they look at enough of the close-ups, they will eventually see it. I’m just sayin’.